If you put a modern platformer in a box, and you couldn’t see the mechanics and gameplay of that platformer, would the genre be dead or alive? Though the question of Schrödinger’s Side-Scroller remains unanswered, the purple kitty who draws his namesake from Schrödinger’s other, more famous (and real) question plays within a platforming world that shows the good side of what the genre can be in this day and age. Schrödinger’s Cat and the Raiders of the Lost Quark is a magnificent throwback to the golden age of 2D platforming. 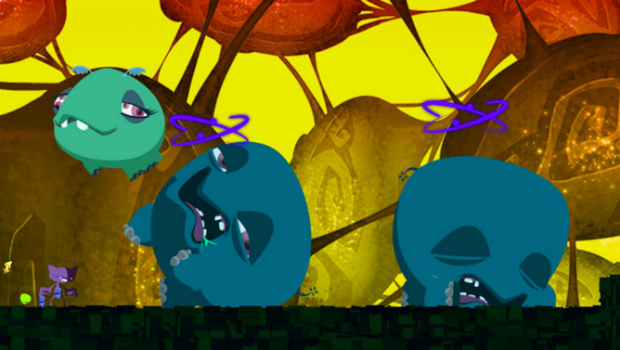 Raiders of the Lost Quark tells the story of the particle zoo, a vast microscopic realm where all of the world’s particles are kept for the public’s viewing pleasure. Something nefarious is about, and the aftermath of that nefariosity is empty cages, released particles, and general madness about the zoo. Thankfully, our heroic feline protagonist, Schrödinger’s Cat, isn’t far off and comes to solve problems and restore the zoo back to sanity. To accomplish this task, the cat uses little power-ups called “quarks” to smash, create, destroy, and move around the levels. Used in a combination of three, quarks have special abilities that make the cat more mobile, protected, or gives him a platform or needed boost. There are 4 quarks in total, each with a different base power. The “Up” quark makes up go up, and the “down” quark helps you get down. The other two quarks are construction based: a protection quark used for shielding, and a general construct quark that creates tools or platforms for the cat to use. Gameplay is not much more than your basic platforming fare. There aren’t levels, but there are different areas that you can navigate between freely. The objective of the game is to defeat and capture all of the loose creatures in the zoo, which can be accomplished fairly easily. Schrödinger’s Cat has a basic punch/kick attack that has a massive range illustrated by cutesy little science symbols and big swooping arrows on-screen. This sort of “magic” strike can get enemies even through thin walls and floors. While it sounds cheap, it’s actually quite merciful of the developers and helps keep the game flowing. As you navigate the level you collect the quarks you’ll use to navigate the room. Different combinations of quarks do different things, like create bombs and missiles, platforms, trampolines, protective bubbles, and a few other attacking/capturing tools used against the enemy. The ground is made of two substances: one that is solid and can’t be modified, and another rocky-like ground that can be blown up, drilled through, and otherwise changed to morph the level. The changes you make are saved for the entirety of the game. If you make a shortcut, then it’ll stay there for you, but if you mess up and put something out of reach, then there isn’t any going back on that either. There is an ongoing story-arc that moves you along from room to room, but the true objective is to defeat and capture all the enemies in a single area. There is a combination of quarks that creates a net, and the net captures and carries the defeated enemy off back to it’s cage. While the game doesn’t force you to capture all enemies to move along, it is advisable to do so. When you use a combination of quarks, the quarks you use are returned to their original location on the map. You can recollect and reuse all the quarks in the game, as long as they are accessible. The game gives you quarks that you collect easily as you navigate the level, but you can also do some creative bombing and breaking to free quarks trapped in the ground. The more quarks, the better and more powerful you are. At the end of each level, the quarks you don’t use are collected in a vessel and become available for collection when you enter the level again. Overall, the game plays smoothly and makes for challenging, yet simple to learn methods, strategies, and combinations. The levels are designed well and the ability to mold the terrain somewhat to your liking helps to hide any problems that may otherwise had shown itself. The main problem with the game, however, is the monotony of the levels. All of the levels look the same, and feel the same, and many times you’ll see the same puzzle-like section across several rooms. The world is mostly grey and semi-amorphous without the copy-and-paste nature of some of the level settings. Adding to the monotony is the acute lack of variance in terms of challenges and enemies. The challenges get old rather quickly, but the game manages to keep things close enough to fresh to avoid disaster. With the existence of only three primary enemies, one of which doesn’t have any attack aside from a temporary quark grab, the game just starts to bleed together and stagnate with longer gaming periods. The backgrounds and other graphics aren’t bad but they aren’t special in anyway. Character design is good enough to pass, but a lot of the particles are just random shapes, so without any real reference it’s all just randomness. The music and sounds are also nothing special but not a drag in anyway, though the voice acting is particularly funny and better than expected with this type of release. Nobody is going to play this game for it’s graphics and sound, and where it lacks in these areas, it stays strong enough in other areas to overcome the general blandness of the game’s design. Schrödinger’s Cat and the Raiders of the Lost Quark makes you feel young again, with a rather loyal modernization of the classic platforming game. While the game can drag after long periods of play, the overall fun and innovation of the game makes the effort a success.